LRIs have never been safer and simpler. 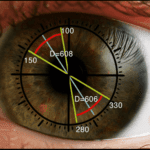 Age, Pachymetry and IOP adjusted LRI Vector Calculator for precise correction of astigmatism. 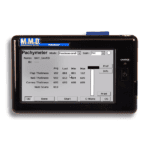 Micro Medical Devices has introduced its exclusive “Age, Pachymetry and IOP adjusted LRI calculator”. This package, which is tailored for correction of astigmatism, is a recommended option for the PalmScan P2000 and AP2000 devices. Single use and disposable Pachymeter tip covers allow measurement of patient corneal thickness without the risk of patient cross-contamination. They are sanitized by Gamma Radiation. These are packaged in a box of nine within a sealed pouch. 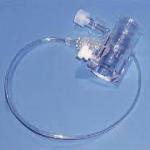 This products containes no Latex and is safe to use on patients who are allergic to Latex. Ultra-thin Planar Corneal Lamellar Grafts for DSAEK procedures are currently the gold standard in endothelial transplant technologies. Accurate and reliable measurement of full thickness, thin-flap and ultra-thin corneal flaps are vital and necessary steps for successful corneal harvesting procedures. Direct measurement of corneal flaps during Lasik surgery, without the need for subtraction pachymetry, has been a highly desired feature for refractive surgeons. Until today, many surgeons calculate the thickness of the flap with the use of subtraction pachymetry technique which is not very accurate and requires a secondary measurement from the corneal stroma. 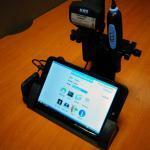 The PalmScan Workstation is a convenient place for safe keeping and use of PalmScan Tablet, probes and accessories. It allows for placement and storage of the PalmScan Tablet, A-Scan, Pachymeter, B-Scan, and Keratometer probes in addition to other accessories. 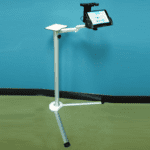 The PalmScan Workstation Table mount is a convenient place for safe keeping and use of PalmScan Tablet, probes and accessories The floor mount lets you securely access to the PalmScan system at almost any location. 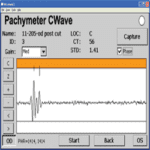 PalmScan Workstation allows for placement and storage of the PalmScan Tablet, A-Scan, Pachymeter, B-Scan, and Keratometer probes in addition to other accessories. 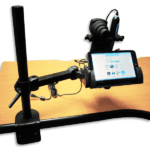 The MMD PalmScan Workstation- Table mount is a convenient place for safe keeping and use of PalmScan Tablet, probes and accessories. The table mount lets you securely access to the PalmScan system in a multitude of convenient locations. Hard Corneal Shell used for Immersion Biometry. 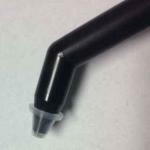 It includes “Probe Set Screw” and “Fluid Intake Valve” for ease of use.